(Phys.org)—A team of researchers at Vrije Universiteit Amsterdam in the Netherlands has found evidence of water on the moon during the time it was formed. In their paper published in the journal Nature Geoscience, the team describes how experiments they conducted in their lab showed that there was a strong likelihood that water was present on the moon shortly after it coalesced from material blasted off the surface of the Earth by a collision with another object such as a planet. Over the past several decades, scientists have learned a lot about the makeup of the moon—they believe, for example, that the magma present at its birth was made up of iron, titanium, calcium, aluminum, magnesium and, of course, oxygen and silicon. They also know the makeup of the crust, which is a mineral called plagioclase and how thick it is. In this latest effort to better understand the moon's earliest history, the researchers mixed the same ingredients as the early moon in a container in the lab and then exposed it to the same heat and pressure conditions that they believe existed while the moon was forming. Doing so caused crusty plagioclase to form on its surface similar to that found on the moon, with one major difference—its thickness. When extrapolated to the moon, the artificially created plagioclase should have been much thinner than it was. The team reran the experiment several times, sometimes adding water to the mix, and found that doing so caused the faux plagioclase to be proportionally the same thickness as the real deal on the moon—and perhaps more importantly, it was the only way the team could cause it to come about. 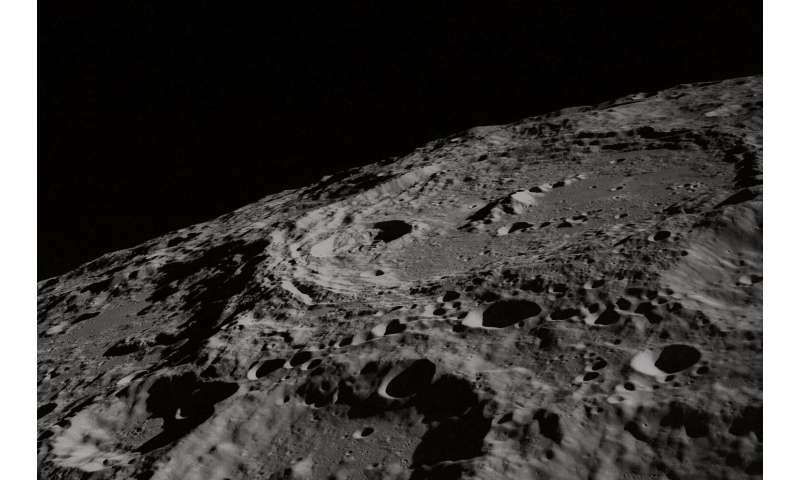 This, the researchers claim, strongly suggests that there was water on the moon during its formation. Showing that water was present during formation of the moon adds credence to arguments by other space scientists who have put forth theories suggesting that the Earth had water in its mix of ingredients during its formation as well—because most agree that the moon was formed during nearly the same time frame as the Earth. And if that is the case, then theories about water being brought to Earth by comets are wrong. The Moon is thought to have been covered initially by a deep magma ocean, its gradual solidification leading to the formation of the plagioclase-rich highland crust. We performed a high-pressure, high-temperature experimental study of lunar mineralogical and geochemical evolution during magma ocean solidification that yields constraints on the presence of water in the earliest lunar interior. In the experiments, a deep layer containing both olivine and pyroxene is formed in the first ~50% of crystallization, β-quartz forms towards the end of crystallization, and the last per cent of magma remaining is extremely iron rich. In dry experiments, plagioclase appears after 68 vol.% solidification and yields a floatation crust with a thickness of ~68 km, far above the observed average of 34–43 km based on lunar gravity. The volume of plagioclase formed during crystallization is significantly less in water-bearing experiments. Using the relationship between magma water content and the resulting crustal thickness in the experiments, and considering uncertainties in initial lunar magma ocean depth, we estimate that the Moon may have contained at least 270 to 1,650 ppm water at the time of magma ocean crystallization, suggesting the Earth–Moon system was water-rich from the start.